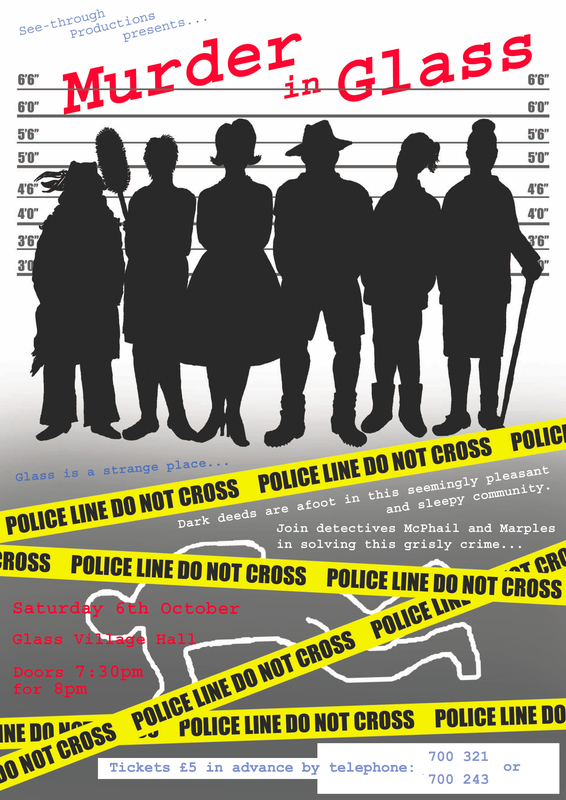 See Through Productions present a MURDER IN GLASS! You thought this area was quiet and crime-free. Just wait till you have experienced ‘Murder in Glass’! A chance to see some of your neighbours, as you have never seen them before – people you knew and trusted, involved in cruel intrigue and evil goings-on! This is the first production from Glass’s new drama group, ‘See Through Productions’ – a ‘Whodunit’, where we ask the audience to identify the killer before the detectives. It’s a lighthearted mixture of drama, mystery and humour. Tickets are now on sale £5.00 per person, for more information or to buy tickets please call the telephone numbers shown below or contact us here. Posted on 15/09/2012 by Secretary GCA.